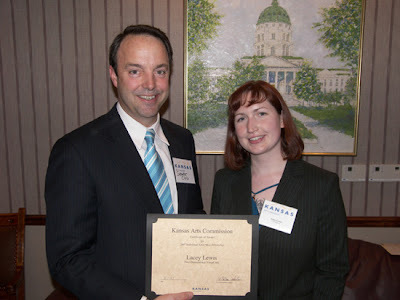 Here is the picture that I promised from the Kansas Arts Commission Fellowship and Mini-Fellowship Awards Ceremony. Senator Chris Steineger presented me with the award, and also provided lively conversation. He seems very much 'for' the arts, as he carried the names and numbers of local arts people with him in his pocket, and I heard through the grapevine that he also spoke earlier that day in the capitol at an art day event put on by the Kansas Arts Commission and the Citizens for Art. P.S. I look awfully short here, but really he is a tall-ish fellow.